In Punjar, even the nobility have secrets to conceal, and the Dev'shir have more than most. An heirloom, stolen from the City of the Dead, leads the heroes on a perilous quest through the city's darkest alleys and byways, into a long abandoned crypt, and against an army of shambling corpses. 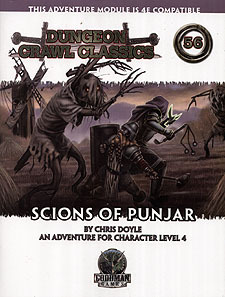 This stand-alone adventure can be played individually or as the sequel to DCC #53: Sellswords of Punjar.